This morning, TPPF hosted a Policy Orientation Panel, "Should local governments use Taxpayer Money to hire lobbyists?!?" Obviously, anyone who's read this website for more than 5 minutes knows where we stand. But it was still an interesting discussion. From a strategic perspective, the most important takeaway is that nobody was willing to show up to defend the practice. This despite the fact that TPPF extended "over 20" invitations to groups one would expect to be supportive. That's notable because we've learned from experience that when people are no longer willing to show up at TPPF to defend a practice, it's often a sign that those involved know they've lost the argument. The panel featured local Austin attorney Roger Borgelt and a staffer for Representative Matt Shaheen [Note: Shaheen had been originally scheduled to speak on the panel, but came down with the flu yesterday]. Borgelt began by explaining how, during the annexation debates the past few sessions, all of the support came from average citizens while all the opposition was taxpayer funded. This is true for any number of public policy reforms that would reduce the size of government. Moderator Chuck DeVore asked if, in banning taxpayer funded lobbying, we would simply be transferring the problem to local governments who would hire bureaucrats dedicated to "government relations." That's obviously one workaround political subdivisions would try, but it would still represent an improvement over the status quo. At a minimum, if a political subdivision wants to hire a full-time bureaucrat to perform "government relations," they'll have to disclose it in their budgets. Furthermore, it's better to have a local bureaucrat representing their political subdivision full time rather than a capitol lobbyist who could have any other number of clients with any number of other potential conflicts of interest. 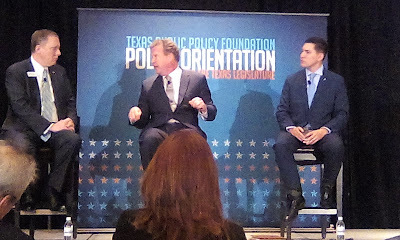 During Q&A, TPPF attorney Chance Weldon pointed out that taxpayer funded lobbying is a form of compelled political speech. As such, it's flagrantly unconstitutional. We'd never thought about that before, but Weldon is absolutely correct and there should probably be a lawsuit. As for this Author, we asked a question that pointed out how taxpayer funded lobbying is a gatekeeper issue that needs to be addressed before any number of other limited government reforms (eg. Property Taxes, Bond Transparency, Parental Educational Choice) can become politically feasible. Taxpayer funded lobbying inherently tips the scales in favor of big government. Disconcertingly, we also learned that public sector unions are growing faster in Texas than anywhere else in the country. Bottom Line: Local governments have no right to use taxpayer money to lobby the legislature. For every public entity that lobbies, there's a private entity that holds the same position. Ending this practice is a necessary step if we're ever going to get serious about restoring government in Texas to it's constitutional framework.